* Next Day Delivery applies to normal working days Monday to Friday excepting public holidays. Scottish highlands and islands two day courier delivery. 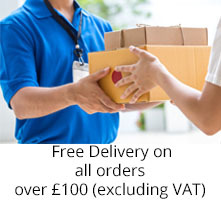 If you wish to return any items then please contact us as soon as possible after delivery. Items will not be considered for return 30 days after the date of dispatch. All return costs are to be paid by the customer. All these cookies are classified as essential and so are totally compliant with the new cookie law.